Boeing Co and Airbus Group SE said on Thursday they expect Indian airlines to order up to 1740 jets over the next 20 years, as aircraft manufacturers eye one of the world's fastest-growing aviation markets to offset any weaker sales elsewhere. Boeing said falling fuel prices, increasing numbers of Indians wealthy enough to travel by air and improved airport infrastructure would boost orders. The company expects airlines to buy 1740 planes worth $240 billion by 2034, its senior vice president for Asia-Pacific and India sales, Dinesh Keskar, said at an event at this week's Indian Aviation airshow in the southern city of Hyderabad. Airbus, at the same event, said it forecasts India will require more than 1,600 passenger and freighter aircraft, three-quarters of them narrow-body jets, over the next 20 years, offering $224 billion worth of business. "India's growth can help offset the slowdown in other parts of the world," Boeing's Keskar told Reuters after the event. Aircraft executives are looking to India to support sales after global economic uncertainty overshadowed recent aviation shows in Singapore and Dubai, raising worries about a slowdown in orders. However, plane makers meeting in Singapore last month defied the industry's growing number of sceptics, saying an unprecedented expansion in the aerospace industry is into its eighth year, supported recently by low oil prices. Indian budget carrier SpiceJet Ltd is in talks with Airbus and Boeing to buy about 100 planes, worth about $11 billion at list prices, but has yet to finalise the purchase. Boeing is keen to clinch the order to keep a foothold in the low-cost Indian carrier market, while a win for Airbus would cement its position as the country's dominant supplier of narrowbody planes. "Airbus is being very aggressive and I don't blame them. We have a relationship with SpiceJet that dates back to 2002. We have worked with them in good and bad times," said Boeing's Keskar. InterGlobe Aviation Ltd's IndiGo finalised the purchase of 250 A320neo aircraft in August, handing Airbus its largest-ever order by number of planes. Other airlines are also looking to grow their fleets to win more of what is expected to become the world's third-largest aviation market by 2026. The number of Indian passengers has jumped more than 20 percent in the past year. India's biggest airlines including SpiceJet, Jet Airways (India) Ltd IndiGo and GoAir, largely money-losing until this year, are now profitable as the outlook for the market improves. "We are confident about the India forecast because of economic growth, middle class growth and airlines are doing well. 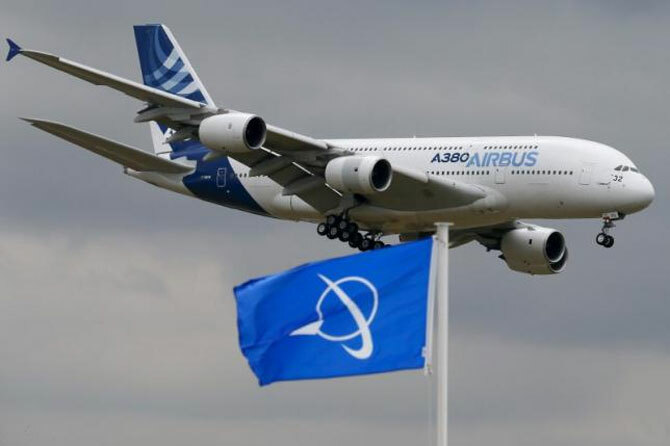 There is a relatively low number of aircraft compared to other emerging markets," Airbus' head of marketing in Asia Joost Van Der Heijden told reporters in Hyderabad. Will Uber bring helicopter service to India also?